Yaron Levi is the CISO for Blue Cross and Blue Shield of Kansas City (Blue KC). In this role he manages a team responsible for information risk management, cyber defense, regulatory and compliance, architecture and engineering, and identity and access management for an organization that provides health insurance for about 1 million members and over $2B in annual revenue. Prior to joining Blue KC, Yaron was a Director of Information Security for Cerner Corporation; an Information Security Business Partner for Intuit; an Information Security Architect and Product Manager for eBay; and a Director of Cloud Security for ANX. Yaron is a Research Fellow for the Cloud Security Alliance (CSA). The Research Fellow designation is the highest honor and distinction that can be given to a CSA research volunteer who has demonstrated significant contributions to CSA research. Yaron is a co-chair and lead architect of the Cloud Enterprise Architecture. Contributor to the Consensus Assessments Initiative Questionnaire (CAIQ), Cloud Controls Matrix and Promoted the CSA as best practice in various cloud projects with various Fortune 500 companies. 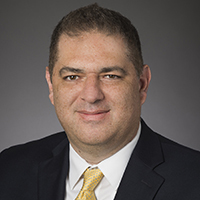 Yaron is the co-founder of the Kansas City CISO forum, B-Sides Kansas City, and is a frequent speaker on Cyber Security Architecture, DevSecOps and Cyber Defense. Yaron also serves as a board member for InfraGard KC, an advisory board member for several security companies and VCs. Yaron holds a B.A in Social Sciences and Management and is a graduate from the FBI CISO Academy.